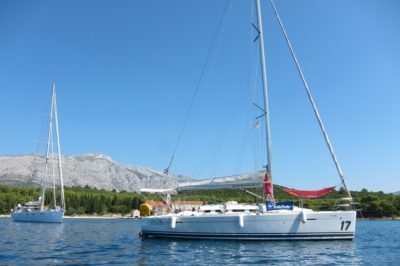 Sailing around the Dalmatian islands of Vis, Komiza, Lastovo, Mljet, Korcula, Hvar and Brac. Morning cappuccino on the waterfront, fresh croissants and a stroll around town, secluded coves, secret anchorage spots and pristine beaches. Swimming, jumping off the sailboat and marveling at the crystal-clear emerald waters of the Adriatic Sea. Exploring the region that was once part of the territorial waters of the Venetian Republic and visiting well-preserved medieval villages and monasteries built in stone. Islands with countless days of sun and a picturesque landscape. 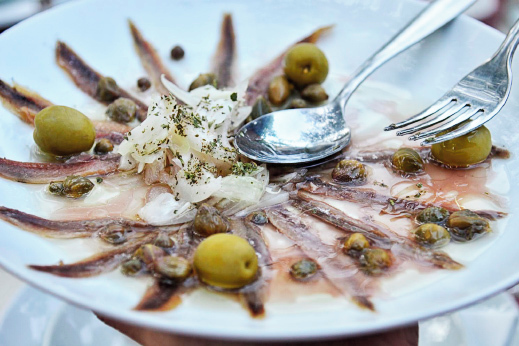 Gelato, shopping, gourmet dinners and wine tastings. Upon request from May to October. Arrival to Trogir or Split (we start in one of the marinas between Trogir and Split). 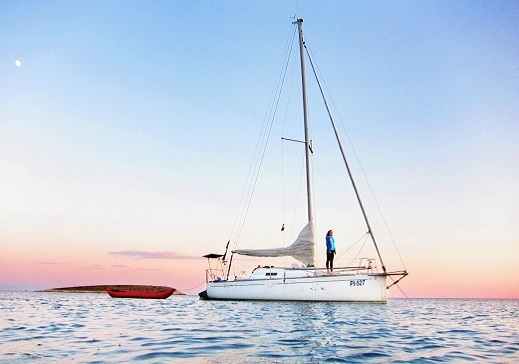 We buy the groceries, board the sailboat and set off. 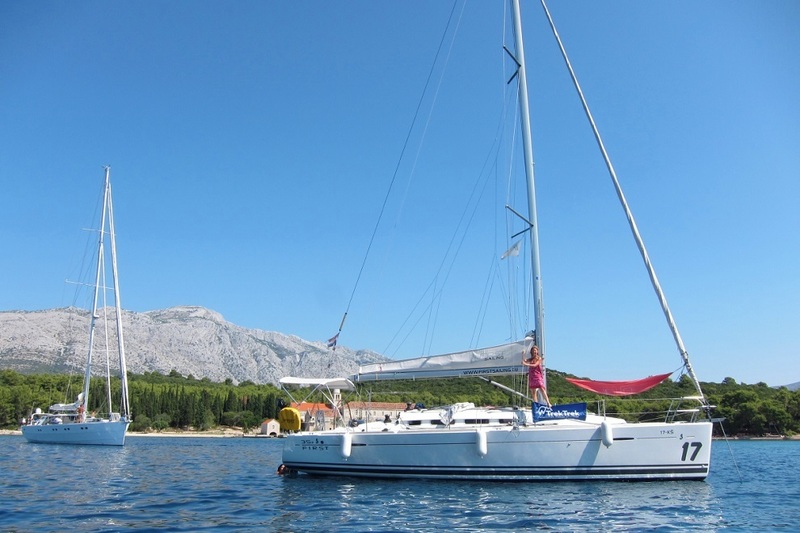 Weather permitting we sail directly to the island of Vis, anchoring in the town of Vis. Distance to the island is 27 NM. We can average 5-6 nautical miles per hour with an engine and 4-7 NM on sails. We visit the magnificent town of Vis, which dates back to the ancient Greek times. We take a stroll around town and treat ourselves to fresh croissants and a morning cappuccino on the waterfront. Then we set off to explore the hidden coves of the picturesque southeastern side of the island, which offers many great spots for swimming, diving and enjoying the pure nature. We spent the night either anchored in a secluded cove or in the town of Komiza on the southern end of the island. Komiza, with the oldest fishing community on the Adriatic, is a true gem where you can experience the Mediterranean as it once was. Our friend Sanja will give us some fresh organic vegetables from her garden. Sailing distance of around 16 NM, so there is plenty of time to spend on the beach. Locals still wearing their traditional clothes is what makes the experience of the island of Bisevo even more pristine. Today’s highlight is the small island of Bisevo, 5NM away from Vis. Totally secluded and wild, it is famous for the Blue Grotto, an amazing limestone cave only accessible by swimming or with a small dinghy. In the morning hours there is a surreal blue color in the grotto. We visit the island and some great emerald coves. We continue on to Lastovo, the most isolated island in Dalmatia, which lies some 35NM away from Vis. 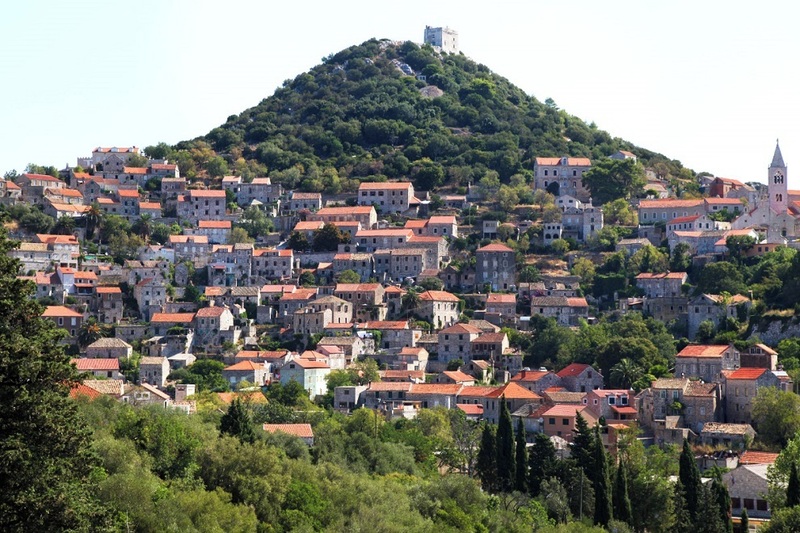 Just like Vis, Lastovo was off-limits for foreigners for decades during the time of Yugoslavia. It only became accessible again in the late 80’s and thus kept its unique character. Lastovo is the icing on the cake of this trip as more or less only the yachties can visit it. This is our longest sailing day and we break the voyage on the island of Susac for swimming and lunch. We will moor the boat in a small private marina in a beautiful bay called the Secret Anchorage, which is well protected from the ocean swell due to its natural topography. Unspoiled secret beaches you enjoy private for the day. 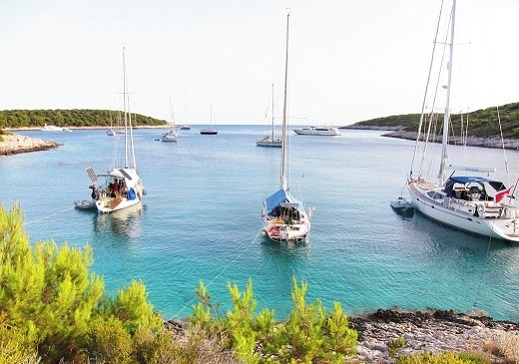 Already deep in southern Dalmatia we enjoy a more relaxing day with less sailing time. First we visit an archipelago of tiny islands close to Lastovo, which is a true paradise of crystal-clear waters. We spend some time there before sailing to the island of Mljet, which is a wild and beautiful national park famous for its salt lakes (warm and great for swimming) and a medieval monastery. Today’s sailing distance is around 22 NM. 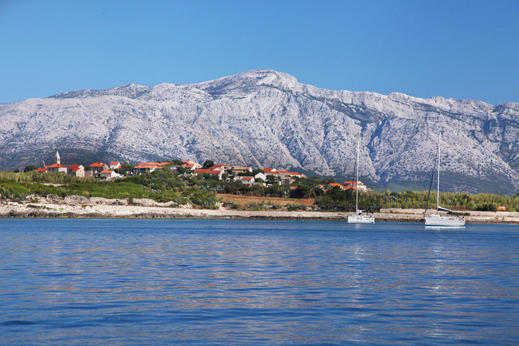 Sailing along Korcula island with Velebit mountain range in the background. Today’s destination is the big island of Korcula. 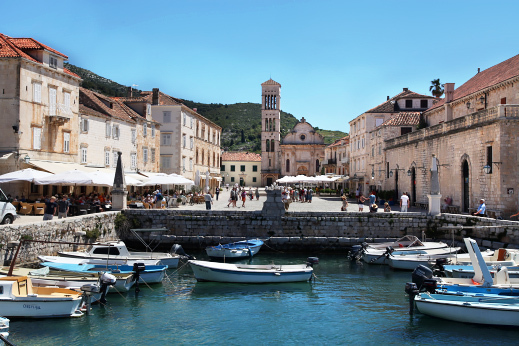 Our first stop is the magnificent medieval town of Korcula, which was once home to Marco Polo and an important sea entrance to what were once the territorial waters of the Venetian Republic. We end our day in the northern part of the island, at Vela Luka. The island of Hvar is often referred to as the most beautiful island in the world, and for a good reason. The sun never stops shining on its picturesque landscape, which is dotted with small medieval villages built in stone and swathed in lavender fields and vineyards. Surrounded by the clear blue sea and home to a fascinating culture dating back to the Venetian times it is a truly unforgettable destination. 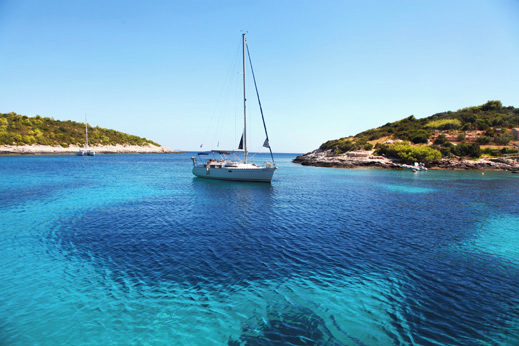 In the morning we set sails for the rugged southern side of Hvar Island. There are some great swimming opportunities along the way as we pass numerous hidden coves. A highlight of the day is a visit to the town of Hvar with its old Venetian architecture. Time for gelato and shopping in great artisan shops with jewelry including coral, silver, turquoise and more. Afterwards we move to the nearby Pakleni Islands to experience the beautiful marine landscape and great swimming. This is also the place where you can find one of the best restaurants in Dalmatia hidden in a forest of Aleppo pines. We spend the night at Marina Palmizana on Pakleni Island. Today is a very relaxed day. We continue sailing around the Pakleni Islands and along Hvar’s western coast to look for the nicest spots for swimming and sunbathing. We finish the day on Brac Island, our last stop before returning to the mainland. Sailing is very dependent on weather conditions. Our actual itinerary can change due to bad weather, strong winds, winds blowing from wrong direction, and other unpredictable factors. Since the safety of our passengers is our first priority the skipper has the right to change the sailing route and will always look for the safest place to moor the boat in the case of a bad weather forecast. Being a private group you can change up the itinerary and let the skipper know where you would like to go and what you would like to do.